This amazing Snowman is approx. DAN DEE RUDOLPH THE RED NOSED REINDEER SINGING LIGHT UP NOSE PLUSH TOY 7"
NOSE LIGHTS UP AND SINGING RUDOLPH THE RED NOSED REINDEER SONG WHEN PRESSED. DAN DEE RUDOLPH THE RED NOSED REINDEER PLUSH TOY. HARD PLASTIC RED NOSE. Rudolph The Red Nosed Reindeer Clarice Stuffed Animal Plush Dan Dee Collector's Choice Christmas Plush. Polyester Fibers. Up for sale is a Dandee Rudolph the Red Nosed Reindeer 16" Xmas Plush Doll. He is wearing a hat and scarf. See photos for item condition, this is a picture of the actual item. Movie " Rudolph The Red Nosed Reindeer". The Red Nosed Reindeer. younger Rudolph in the made for TV. This is Rudolph as he was when he was a. 8-3/4" Plush by Dan Dee. from the 1964 TV Movie. Baby's First Rudolph 2014! Sorry for this spill, but it is becoming increasingly necessary. Dan Dee The Rudolph Red-Nosed Reindeer Clarice Plush Stuffed Animal 12"
It is missing the scarf. It is 12" tall. 100% GENUINE ! This is for aDan Dee Rudolph The Red Nosed Reindeer Plush. RED NOSED REINDEER. 2013 DAN DEE COLLECTOR'S CHOICE RUDOLPH THE. WEARING RED PLAID FLEECE HAT AND SCARF. VERY SOFT STUFFED PLUSH. 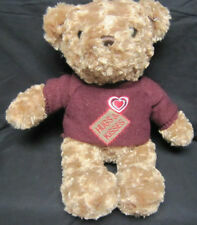 CLARICE LARGE Dan Dee Plush 14" tall by 12" long. See photos. Item sold as is. See photos for actual item. Sold as is. Cute little Christmas deer, we all love Rudolph. In Great Condition! Shipping only within the Continental US. NOSED REINDEER BY DAN DEE COLLECTOR'S CHOICE. MADE IN CHINA IN 2010. FINE CLEAN CONDITION. His Body Sways - Nose Flashes & Children Sing Rudoplh the Red Nosed Reindeer. Dan Dee Rudolph the Red Nosed Reindeer. A BIT OF THIS & THAT. HAS WEAR FROM HANDLING . IN GOOD CONDITION~. Adorable Clarice plush from Dan Dee. Wearing a cute pink bow. Stands approx. --IF PURCHASING OUTSIDE OF THE UNITED STATES. In the rare event that I cannot, I will communicate this to you. 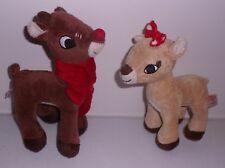 DanDee Collector's Choice Plush Rudolph the Red Nosed Reindeer! Vintage plush Rudolph the Red Nosed Reindeer comes with his original scarf and still has plenty of love left in him! This would look adorable next to your Christmas tree or as a snuggle buddy for the littles on Christmas Eve! 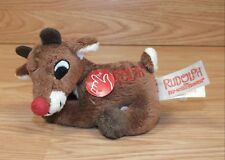 DAN DEE RUDOLPH THE RED-NOSED REINDEER STUFFED PLUSH - GOOD USED CONDITION! 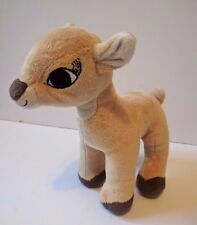 This is for a cute Dan Dee Rudolph the Red-Nosed Reindeer Stuffed Plush, Good Used Condition! This cute Rudolph is very soft and cuddly. Rudolph the Red Nosed Reindeer Plush. Disney, Universal, Collectibles, Toys.